Heat resistant wigs may be confusing for someone who has never heard of them before and it is totally normal. The first thing you need to know about this kind of wigs is that they are actually synthetic wigs, but with a twist. Their most important feature, is that they have been crafted with a modern type of fibre called flexi fibre. This technological miracle, allows you to style your wig as you would normally style your natural hair. Not so complicated, right? However, in order to understand if this is the perfect wig type for you, let’s see some benefits and useful information. These will surely help you get to know heat resistant wigs a little better and will make your decision way easier. 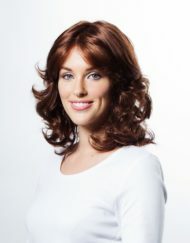 Heat resistant wigs are the perfect alternative to real human hair wigs, although they cost less. They are reasonably priced, so they make a really good choice before you decide to invest in a human hair wig. This type of wig not only gives you the ability to wear it as it is, but you can also style it however you like. You can blow dry it, curl or straighten it, creating a different look each day. Always remember to use the correct heat setting (up to 120 degrees) on the styling tools you’re using to avoid damaging the hair. You can choose between a great variety of colours, lengths and styles, as well as the cap construction you like; monofilament, hand tied or lace front. By creating the ultimate combination of style and cap construction, you gain comfort and realistic look. Despite they are synthetic hair, heat resistant wigs, have a super natural and realistic look due to their high quality construction. They are also light weight and their colour doesn’t fade. Some amazing styles to look at are the Sentoo Premium Plus Wigs.